The last 2 months have been tough for shareholders in the major Australian Banks. Their share prices have dropped throughout March and April. Evidence of misconduct presented at the Royal Commission on Financial Services has created uncertainty about the future for some the worlds most profitable banks. Traditional analysts will consider if the Royal Commission change the actual demand for mortgages, will it slow down credit growth etc. Oddly enough people are asking the question “has my trust in the banks been misplaced?”. Clearly the answer is “YES”. Remarkably enough Pythagoras already had the “Advance Knowledge” of which banks would fail the test. We call Pythagoras the White Box – it is a computer program working based on our concepts and formulas. The basis upon which we work is that volatility has an inverse relationship to price, ie when volatility is up, price is down and when volatility is down, price is up. Each quarter, we work out what is an acceptable level of volatility for each stock and sector of the market (based on a mathematical formula). Whilst the volatility remains within that range, investments in that sector are treated accordingly. If the volatility moves outside the predicted range, a further set of formulas are enacted to treat the stocks and sectors differently. If and when the volatility moves past a significant level outside the predicted range (again pre-set as a formula) they are treated differently again. There is a further pre-set level outside the predicted range, where we stop trading altogether because the market is no longer in a state of predictability. As you can see, the level of volatility in each sector and each stock drives our system and depending on the level of volatility it extends or shortens the times between the signals to buy or sell. It is based on the understanding that volatility drives the stock market – and the market runs in patterns. Events affecting the market happen within those times of volatility. In saying this, what is clear is that there are reasons stocks move outside our predictable ranges on a consistent basis. The reason for this is that the practices of such companies makes them unpredictable, that is, they are not trading in accordance with any known or proper pattern, which includes them using improper practices. As a consequence, the only major bank that Pythagoras has so far accepted as being trade worthy has been the NAB, which, to date, has largely escaped the wrath of the Royal Commission. This is more than us ethically investing, by not using companies who fall outside our ranges of proper behaviour, we are safeguarding your investment in the long term. Our system knows the market, how it works and why and over 100,000 lines of code allows us to predict the most safe stocks to invest in with good returns. Our stocks cover all sectors and include both large and small companies. 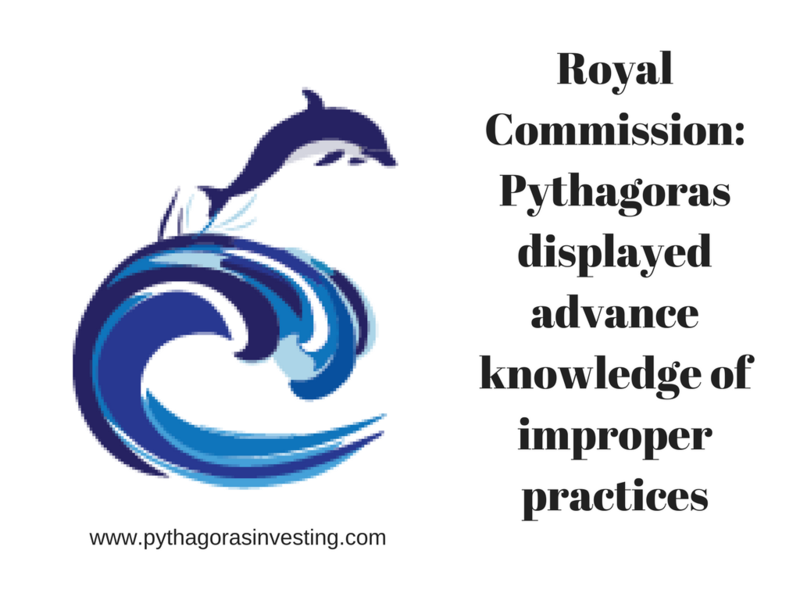 Want to know more about Pythagoras and the stocks we are using, visit www.PythagorasInvesting.com or call me on 0419726223 to organize a meeting with you. ← Santos: Pythagoras trades again!